Certain fish have scales while in the water, but they shed their scales when caughtIn order to render a fish kosher, the scales must be visible to the naked eye5 and they must be easy to remove from the skin of the fish, either by hand or with an instrument.6 If the scales can be only be removed after soaking the fish in scalding water, there are differing views as to whether the fish is considered kosher.7 Sturgeon is one such fish, and, in practice, it is not considered kosher. If a young fish belongs to a species which develops scales when they mature, it is kosher even if it has not yet developed them.9 Conversely, if a type of fish has scales when it is young but not when it matures, there are differing views as to whether or not it is kosher.10 A swordfish is one such fish, and the accepted rule is that it is not kosher. 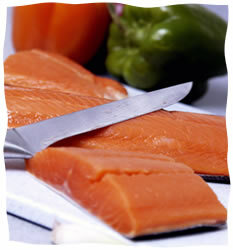 See our Kosher Fish List for a more exhaustive listing of kosher and non-kosher fish. I have heard that one may eat salmon even if one does not see the scales on the fish because the distinct color is sufficient evidence that it is salmon. Any sea creature that does not have fins or scales is not kosher, regardless of whether it is scientifically classified as a fish or whether it actually resembles a fish.19 This means that whales, prawns, shellfish, crabs, octopus, lobster, and shrimp are all not kosher. The eggs of a non-kosher fish are not kosher, while the eggs of a kosher fish are kosher.21 In order to establish that the roe is kosher, one must know that it came from a kosher fish. Therefore, caviar should not be purchased unless it has a reliable kosher certification. When Are Fish Considered Dead? According to the Talmud, it is harmful for one's health to eat fish and meat together. See Fish with Meat or Dairy for more information. Some argue that, for health reasons, fish should also not be eaten with cheese. See the above link for more information. Niddah 51b. See also Tosafot d.h. Kol Chulin 66b. See the Talmud ibid. as to why the Torah does, in fact, mention the fins as a requirement. See Yoma 67b. See also Maharsha there. Nevertheless, several commentaries do offer explanations. Nachmanides (Leviticus ibid.) writes that fish without fins and scales generally dwell deep under the surface of the ocean. As a result, they accumulate more impurities and are therefore not healthy to eat. The Tzemach Tzedek (Ohr HaTorah Shmini 807) writes that fish represent souls of the highest order. The fins represent the love and fear that every soul should have for G‑d, while the scales represent the Torah and mitzvot in which every soul must garb itself. Aruch HaShulchan, Yoreh De'ah 83:15. Nachmanides ibid., Beit Yosef beginning of Yoreh De'ah 83. If they cannot be removed they are considered part of the skin, not scales. Scales are referred to as "garments" (see Talmud, Nidah ibid. ); i.e., something that can be removed. Noda B'Yehuda Tinyana, Yoreh De'ah. 28; Aruch HaShulchan, ibid. 13; Pitchei Teshuvah, Yoreh De'ah 83:1. Code of Jewish Law, Yoreh De'ah 83:1. See there that even one scale is sufficient, but see Rama there that some say that the one scale must be under its cheek, fin or tail. This is to ensure that the scale did not simply fall on it from another fish (Aruch HaShulchan, ibid. 14). Code of Jewish Law, ibid. See Tzitz Eliezer vol. 9, 40. Talmud, Avodah Zara 39a. Rashi on Leviticus ibid., quoting from the Torat Kohanim 11:84, bases this on the verse: "Anything that has fins and scales in the water etc." See Talmud, Chulin 63b, that there are 700 types of non-kosher fish. The number of kosher species exceeds that (Aruch HaShulchan, ibid. 8). See Code of Jewish Law, ibid., 118. See Code of Jewish Law, ibid., 91, Shach 3 and Taz 2. See also Taz 6 on Y.D. 89. See Taz 2 on Y.D. 91. See also Shach 89 on Y.D. 69. Pitchei Teshuvah 5 on Y.D. 96. If one is unsure whether the fish was cut with a clean knife, one may be lenient and not wash the piece (See Code of Jewish Law, ibid., 96:4 with Rama, Shach, and Taz.). Aruch HaShulchan, ibid. 5, but see there 6-11 that according to Maimonides, any creature that doesn't resemble a fish is not kosher even if it has fins and scales. Code of Jewish Law, ibid., 83:9-10. Ibid. 8. See there that certain shapes and colors can be used as identifying factors as to the status of the roe. An unrelated point: It is interesting that the Midrash (Midrash Rabbah, Genesis 7:1, as interpreted by the commentaries there), which was written over 1,500 years ago, says that female fish lay their eggs in the water, and the male fish then fertilize them externally. This is, of course, also the view of modern science. Talmud, Chulin 27b, based on the verse in Numbers 11:22: "If you were to slaughter sheep and cattle for them… if you were to gather all the fish of the sea, etc." Thus the Torah compares the gathering of the fish to the slaughtering of animals. See also Midrash Rabbah, Genesis 7:2. Rama on Yoreh De'ah 13:1 See there that the laws of eiver min hachai do not apply to fish. Maimonides, Laws of Shechitah 1:3. Talmud, Kritut 20b; Code of Jewish Law, ibid., 66:1 This is derived in Kritut 21b from the fact that fish need not be slaughtered. Code of Jewish Law, ibid., 9. Fish in a fish The kosher fish remains kosher even if it has a non kosher fish in it belly. And certainly if it ate and digested a non kosher fish. However, the non kosher fish that is inside the belly of the kosher fish, remains not kosher. If a kosher fish has a non-kosher fish in it's belly, it makes the kosher fish, not kosher? How do we know if the said kosher fish ate and digested non-kosher fish before it was caught and we do not see it in it's belly? Most of the kosher fish that are caught have some kind of non-kosher / shellfish in it's belly. A fish in a fish You are correct. It is the first fish listed that is kosher. Rambams' advice and whether the nose knows The sense of smell is not the same for a child or young adult, as an adult. Many "food smells" are repulsive to a child or young adult, but don't bother older people at all. Beer, pickles, strong-smelling cheeses, brined foods in general, distilled drinks and other foods are generally very repulsive-smelling to a young person or child. But, they're perfectly fit for consumption and very agreeable to an adult. There are some "smells" that are offensive to many people, but not to other full grown adults, and vice versa. In other words, there is no "blanket advice" regarding what foods may or may not be eaten in regard to the sense of smell.